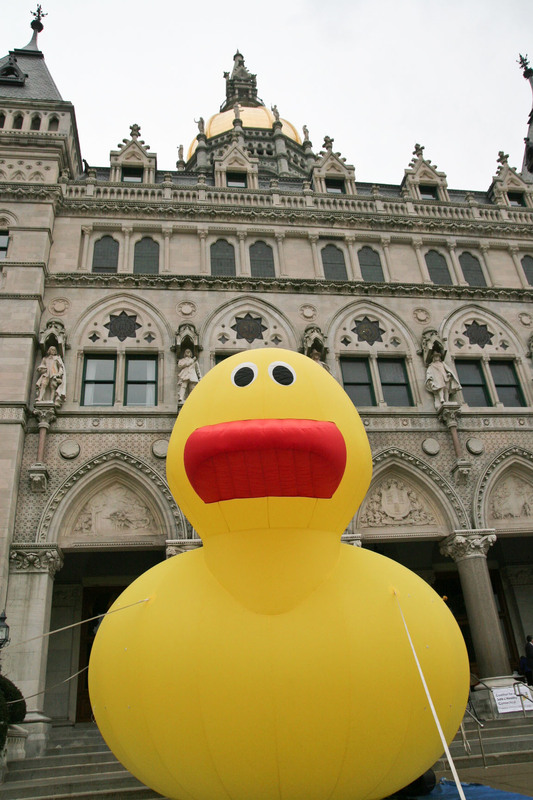 The non-toxic Giant Rubber Ducky looms large in front of the Connecticut State Capitol in March, 2008, symbolizing the feasibility of safe toys made safely. Our mission is to correct the fundamental flaws in government policies that allow harm to our health and environment. • educators, and others seeking preventive action on toxic hazards. Unfortunately, current environment and health policies do not protect us. There is growing consensus that exposure to toxic chemicals in products we use every day are linked to the increased incidence of many serious diseases. Coalition partners are committed to raising awareness of the health impacts associated with toxins found in every day products and establishing new government policies to reduce exposure and protect public health. With over 85,000 chemicals in commerce, we must move beyond banning one chemical at a time. We advocate for health protective policies where chemicals of concern are phased out of certain products as soon as safer alternatives are available. If you or your organization would like to join the Coalition, request a presentation or would like more information, please contact Anne or Susan at 860-232-6232.